The finance discipline requires much more than just mathematical ability. 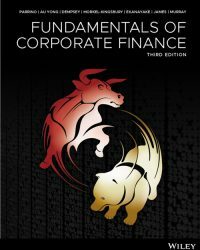 This local third edition of Fundamentals of Corporate Finance, 3rd Edition (Parrino et al.) presents finance in a cutting-edge interactive digital format and encourages you to develop the intuition and analytical skills to effectively apply financial tools in real-world situations. Available as a full colour printed textbook with an interactive eBook code, this title enables every student to master concepts by taking the roadblocks out of self-study, with features that are designed so you get the most out of what you’re learning. This edition includes enhanced coverage of the financial framework, as well as looking in depth at local Australian and New Zealand companies to provide real-world context to the theories you’re taught. These are complemented by features like videos from practitioners that will help you connect the theoretical to the practical, animations and interactivities that will bring what you’re learning to life, Concept Check questions to test your comprehension and allow you to get instant feedback so you can see where your strengths and weaknesses lie, and the opportunity to work between the online (interactive e-text) and offline (print) to cater to how you best study, with the ability to search, highlight and annotate within the text. Practitioner videos provide insights into the application of corporate finance concepts in business. Video cases that highlight the use of corporate finance techniques within large global corporations. Animations of worked examples walk you through the steps in solving corporate finance problems. Interactive ‘stepped tutorials’ provide scaffolding for you to solve problems.